Among all the caring services we provide to your pet, Parkview Pet Clinic offers some basic grooming services. Brush outs, nail trims, ear cleaning and gland expressing are some of the extras that are included /added to our bathing services. Contact our front desk for more information, appointment dates and discounts that are available. Your pet’s comfort and well-being are always out top priority. Choose a location that is easiest to efficiently bathe your pet. This may need to be a bathtub to keep your pet confined, or giving the bath outside may prove to be the easiest location for you provided the weather is right and you can restrain them properly while giving the bath. Thoroughly wet your pet with clean, lukewarm water. 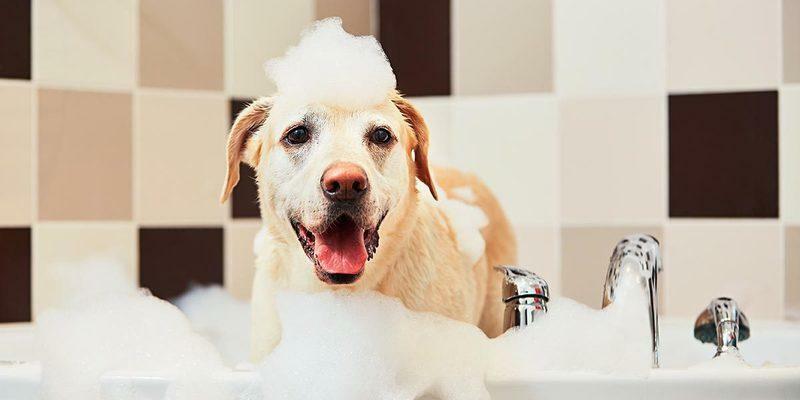 Liberally apply the shampoo and lather it up while massaging your pet. Be sure to apply the shampoo everywhere that you need it. This is particularly important for medicated shampoos so that the treatment is fully effective in the areas it is most needed. Key areas to remember include the pockets where the legs meet the body, skin folds, between the toes, underneath the tail, etc. For medicated shampoos, you must allow a minimum of 5-10 minutes of contact time for the product to achieve its full therapeutic benefit. This means you should apply a medicated product everywhere 1st and then start the clock. Once properly applied and minimum contact time has been met, rinse the product off thoroughly and completely, so there is no product left on your pet’s skin/coat. If additional cleaning is desired, a conditioner can be used after the shampoo process is complete.